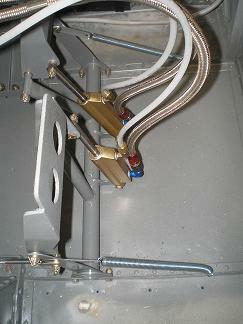 The exact order in which you install the rudder controls isn’t important. You will have to string the cable through the fuselage, install the pedals, and then hook everything up. The end of the rudder cable doesn’t fit through the snap bushings if the bushings are already installed in the bulkheads. 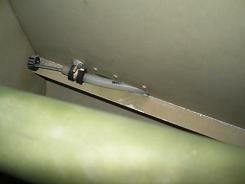 I had to slip the cable end through a bulkhead, then push the end through a bushing. 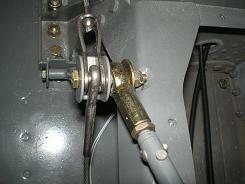 Because the bulkhead wasn’t preventing it, the bushing could bend a little to let the cable end pass through. Then I pushed the bushing into the hole in the bulkhead. I worked my way from the tail to the front, one bulkhead at a time. I took care of the aft end of the cable after I could pull the rudder cable tight between the rudder horn and the rudder pedals. I wanted to be able to see where the cable naturally wanted to sit, so I could put as little pressure on it as possible as it passed through the skin. 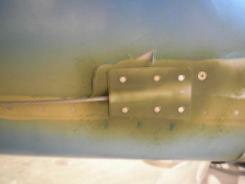 I ended up opening the aft end of the slit in the F-824 skins enough to allow the plastic tube to extend out a little. 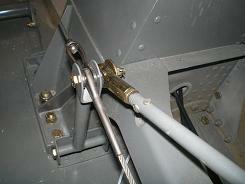 This kept the cable from scraping on the aft edge of the slot in the skin. I will add a specific note to the preflight checklist and to the conditional inspection to look at the plastic tube and the rudder cable for wear. I didn’t like the way the cable-exit holes looked at the aft end of the fuselage. So I bought the fairings to cover them. There is no specific position for these. I placed them to completely cover the hole and the plastic tube. I also made sure the hump in each was aligned with the airflow. Then I looked behind where I wanted to install them to ensure the holes I drilled had a good surface on the backside. I didn’t want to drill through right at the edge of the F-889 longeron and not have room to buck the rivet. I opted for the ground adjustable rudder pedals. They are lighter, and I figured I am the one who will be flying 99% of the time in the front seat. So since it is my airplane, it can fit me. I know this is a pretty selfish point of view, but I remember all the times I crawled into a rental or military plane and had to set the rudder controls and everything else to fit me. I think it will be nice to have it already set for me when I get there. I wanted to keep the rudder pedals looking good, and knew if I just painted them, the paint would get worn off from my shoes. So I found some stick-on “no skid” at Lowes. I cut it to shape and stuck it to the front of the pedals. 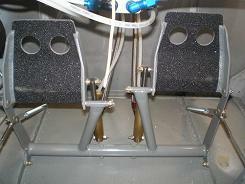 There is no provision on the plans to keep the pedals from falling aft. When the plane is on its gear, the pedals fall aft and down. So I added a light spring to each pedal, connecting it to the forward most hole on the attachment angle. These springs are very light, and do not interfere with full pedal motion, but they are strong enough to keep the pedals upright when not in use. After fitting and drilling everything, I only installed the attachment angles. I didn’t want the rest of the assembly to get in the way as I installed the other parts into the cockpit. I also opted for the rear seat rudder control pedals. After everything was installed and the cables pulled tight, I noticed I have a spot where the cable hits the F-878-L&R mid cabin braces when the pedal is fully deflected in that direction. I will have to grind some of the brace away to get clearance. I will add more thoughts, and show the results here, after I fix this problem. After all the rudder control parts were in place, it was an easy matter to hook everything up. 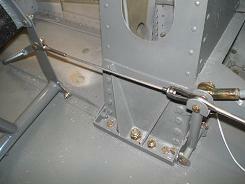 I have left the aft two bolts connecting the cable to the rudder until later. The bolts are there, but I haven't installed the nuts or cotter pins. I want to have the ability to easily remove the rudder if needed, and also to easily have lots of slack in the cables, in case I need them out of the way to do some other work. I'll finally install these bolts after the floor in riveted down, and I have no more work to do under the floor.